Having done landscaping jobs in Columbus since my early 20s, I can't help but be impatient for those early spring days that mark the beginning of landscaping season. The anticipation of being able to spend the whole day outside digging, weeding, mowing and planting...and earning money at the same time! That's truly exhilarating! During my 25-plus years of doing various gardening and landscaping jobs in Columbus, some days were, of course, better than others. But I didn't mind the muddy, rainy or chilly days. It was better than sitting inside wishing I was outdoors! If you are the type of person who truly enjoys outdoor work, working with plants, mowing grass, digging in the soil and you don't mind a little dirt and sweat, then you should consider one of the open landscaping jobs in Columbus for the 2018 landscaping season at GreenScapes. As a lifelong gardener and a friend of GreenScapes Landscape Company, I wish I had worked for GreenScapes in my early years of gardening. Here, you have an opportunity to learn a wealth of important landscaping skills while working with a great crew and talented landscape designers. Working one of GreenScapes' Columbus landscaping jobs can lead to a career in landscape design or landscape architecture. If you are considering landscaping as a career, working at GreenScapes is a great way to further your knowledge while earning at the various landscaping jobs in Columbus with the top Columbus landscaping company. For me, landscaping means being able to work outside every day of the season, learn new things about equipment, plants and best practices, at a job that is both physically and mentally stimulating. Here is some information on the full-time landscaping jobs in Columbus that GreenScapes Landscaping Company has open for the 2018 growing season. GreenScapes Landscape Architects and Contractors is the premier landscape contractor in central Ohio. We are a full-service Columbus landscaping company. GreenScapes offers landscape architecture, installation, landscape construction, and landscape maintenance job in Columbus and Central Ohio. Some of our specialties include outdoor living environments, living roofs, irrigation systems, water features, landscape lighting and snow removal. 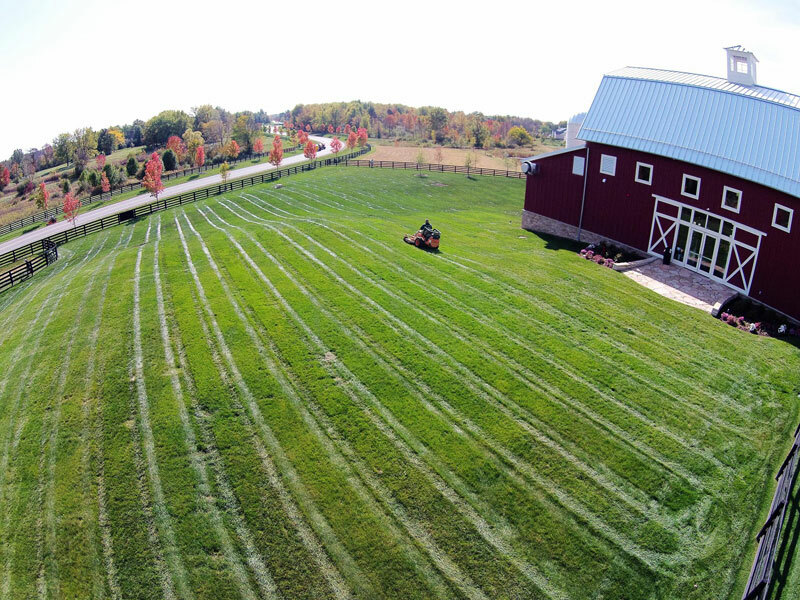 GreenScapes also specializes in mowing, trimming, lawn improvement and all types of landscape maintenance in Central Ohio as well. Celebrating over 40 years in the industry, GreenScapes has the capacity to complete projects of all sizes and has received numerous national, state, and local awards for landscape design, installation, and safety. We are a Live Roof Certified landscape company that incorporates sustainable and environmentally beneficial design elements into all projects. Each season, as we grow, we have a number of new landscaping jobs in Columbus that come open, meaning new opportunities for workers who are interested in careers in landscaping. We are offering several different types of landscaping positions in Columbus and Central Ohio for the 2018 season. We are the premiere Central Ohio landscaping company, and we are looking for qualified, dedicated workers. For those seeking landscaping jobs in Columbus, the following positions are open. Oversee Crew Members, assign daily tasks, and ensure jobs are completed on time. Assist, and train Crew Members on proper mowing, trimming, edging, pruning, weeding, and chemical use techniques. Loading/unloading of trucks and trailers. Proper completion of daily paperwork. Effectively communicate with subordinates, peers, and management. Experience using zero-turn mowers and other commercial grade landscape equipment. For Mowing and Maintenance Crew Leader and Crew Member positions, preference will be given to those with previous mowing experience, and experience using commercial zero-turn mowers and other commercial grade landscape equipment. Assist, and train Crew Members on proper planting, mulching, staking, plant care, paver patio and hardscape installation. Perform proper planting, staking, mulching, plant care/handling techniques and hardscape installation such as paver patios and stone walls. For Landscape Installation Crew Leader and Crew Member responsibilities, preference will be given to those applicants with previous landscaping installation experience, and experience using professional landscape installation equipment. A minimum of High School Diploma or GED is required. An Associates Degree in a related field is preferred, but not required. Previous landscape/maintenance/mowing/installation experience is preferred. Valid driver's license, clean background, and ability to pass a pre-employment drug test. Report to work daily with a positive attitude, be a team player with the willingness to learn and improve. GreenScapes offers competitive pay, Medical, Dental, and Vision coverage, 401K plan with company match, paid vacation, paid holidays, and profit sharing for eligible employees. If you are interested in applying for any of these Columbus landscaping positions, please email your resume to GreenScapes Human Resources at: sscollard@greenscapes.net or call our office at (614) 830-2612. GreenScapes is an Equal Opportunity Employer and a Drug Free Work Place.